GT and single-seater categories are among the impressive line-up that will form the Blancpain GT Series support package throughout the coming season. 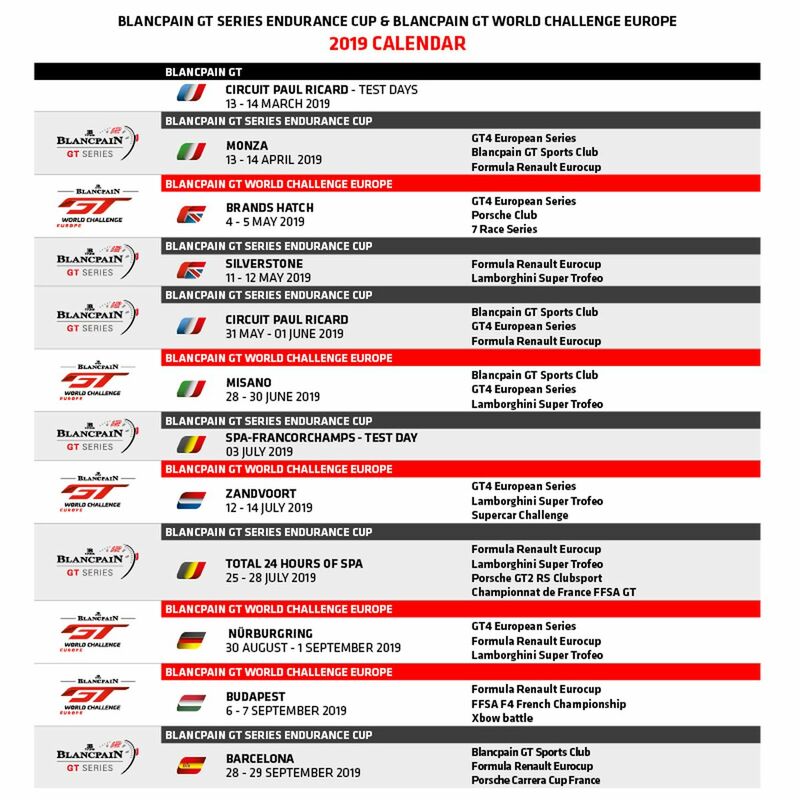 Fans can look forward to a wealth of highly competitive racing at Endurance Cup and Blancpain GT World Challenge Europe (formerly Sprint Cup) events, ensuring the ultimate experience for those watching from the circuit or at home. With a total of seven rounds running as part of the Blancpain GT Series package, the new Formula Renault Eurocup will be the most familiar support category this season. The long-running junior championship ranks among the foremost training grounds for future racing talent, with past champions going on to compete at the highest levels of the sport. Indeed, leading Blancpain GT Series drivers such as Albert Costa, Robin Frijns and Jake Dennis all made a strong impression while competing in the series. In 2019 it will debut a safer, more powerful and more aerodynamically efficient new car, in which today’s crop of young Formula Renault talents will have plenty of opportunities to impress leading Blancpain GT Series team bosses at some of Europe’s finest circuits. 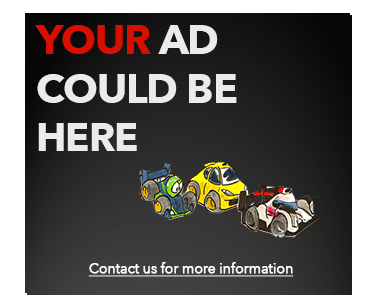 This includes all five Endurance Cup events, with the highlight coming at the Total 24 Hours of Spa (25-28 July). The first two rounds of the Formula Renault Eurocup season will take place alongside the Blancpain GT Series, with the category’s 2019 campaign getting underway at Monza (13-14 April) and continuing at Silverstone (11-12 May). It will then be present at Circuit Paul Ricard (31 May-1 June) before travelling to Spa for a support slot at the world’s biggest GT3 race. Following the traditional August break the series will resume alongside the back-to-back Blancpain GT World Challenge Europe events at the Nürburgring (30 August-1 September) and the Hungaroring (6-8 September). The final link-up between the two series will come at Circuit de Barcelona-Catalunya (28-29 September) for what will be the finale of the 2019 Blancpain GT Series. While the Formula Renault Eurocup delivers the excitement of single-seater competition, there will also be a wealth of high-powered GT action on display in 2019. Race-going fans can once again look forward to the Lamborghini Super Trofeo playing an important role, extending a relationship that stretches back to the formation of the Blancpain Endurance Series in 2011. This popular one-make championship can always be relied upon to produce close racing, with a field of identical Huracan Super Trofeo EVO machines doing battle across Europe. It has also been a breeding ground for future Blancpain GT Series talent, with Mirko Bortolotti among the star drivers who have emerged from the category. In 2019 the Super Trofeo will stage five of its six events at Blancpain GT Series rounds, kicking off at Silverstone before competing on home soil at Misano World Circuit Marco Simoncelli (28-30 June). The series will then travel to Zandvoort (12-14 July), before hitting the track in support of the Total 24 Hours of Spa. The fifth and final Super Trofeo race to run alongside a Blancpain GT Series event will take place at the Nürburgring. While Super Trofeo races are staged using identical equipment, the GT4 category is famed for the wide variety of different machines on-track. Devised by SRO Motorsports Group, the platform enjoyed a landmark 2018 season, with packed grids becoming a theme at events across the globe. This was particularly true of the GT4 European Series, which attracted significant numbers to compete in its highly competitive championship. The foundations have been laid for an even more successful 2019 campaign, with six events at Europe’s leading venues. Each will run in support of the Blancpain GT Series, further strengthening the close ties between the two categories. The championship will kick off with spots alongside the Endurance Cup event at Monza and the World Challenge Europe double-header at Brands Hatch (4-5 May). The GT4 contenders will then make a further appearance on the Endurance Cup bill at Circuit Paul Ricard, before returning to the World Challenge Europe package at Misano, Zandvoort and finally the Nürburgring. Blancpain GT Sports Club will enter its fifth season of competition in 2019. The series gives talented gentlemen drivers the opportunity to compete for overall wins, with further class honours for Titanium (aged 50-59) and Iron (aged 60 and above) competitors. Following an exciting 2018 campaign the series will contest a five-round championship in 2019, with four of those events running in support of the Blancpain GT Series. The season will open at historic Monza, followed by a trip to the South of France to compete at Circuit Paul Ricard. For round three it will return to Italy, racing at Misano alongside Blancpain GT World Challenge Europe. The championship will then stage its only event away from the Blancpain GT Series, running as part of SRO Spa Speedweek (19-21 July). Following this, it will conclude at the Circuit de Barcelona-Catalunya. In addition to the events that will make regular appearances on the support bill, several championships will join the Blancpain GT Series on a one-off basis. The most significant of these will take place during the Total 24 Hours of Spa weekend, when the new Porsche GT2 RS Clubsport will take centre stage for a special launch race. Further details on this exciting contest will be revealed in due course. Also joining the festivities at Spa will be the FFSA Championnat de France GT – GT4 France, where emerging talents compete against experienced drivers in a popular and immensely competitive domestic category. The French series will add yet more excitement to the Total 24 Hours of Spa festivities, with the likes of Alpine, Mercedes, BMW and Porsche all represented. There will be further single-seater action thanks to the French FFSA F4 Championship, which will make an appearance on the Blancpain GT World Challenge Europe support bill at the Hungaroring. Now entering its 10th season using the F4 moniker, the entry-level category has produced several stars during its long history, including current Blancpain GT Series ace Matthieu Vaxiviere. The X-Bow Battle will also join the support package in Hungary. 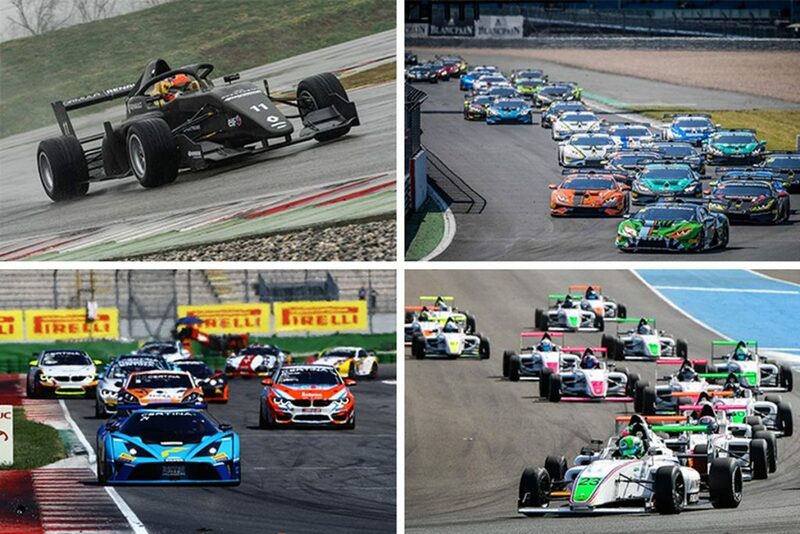 With the unmistakable KTM X-Bow taking centre stage in this one-make series, fans can expect close racing from a spectacular field of machines. 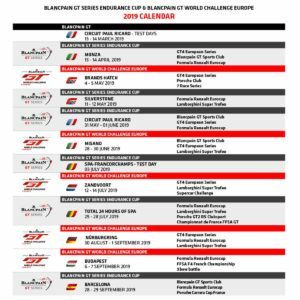 At Brands Hatch, the Blancpain GT World Challenge Europe competitors will be joined by the 7 Race Series and the Porsche Club Championship, while the ever-popular Supercar Challenge will hit the track when World Challenge Europe returns to Zandvoort. Finally, Porsche Carrera Cup France will retain its place on the bill for the season-ending trip to Circuit de Barcelona-Catalunya. With such a variety of support categories set to join the Blancpain GT Series in 2019, the year ahead promises to be hugely exciting for fans in the grandstands and watching at home. The official test days at Paul Ricard (13/14 March) will signal the start of the new season, before racing gets underway at the world-famous Monza circuit on 13-14 April.